Clad in rubber wellies and shorts our winemaker had, literally, just ﬁnished picking his sauvignon blanc grapes. He offered us a cluster to taste and, sure enough, they were pretty ripe, but still had enough acidity to distinguish it from the fat sugar-water grapes that we tend to munch from our fruit bowls. Damnés plot, a steep slope that does not allow for mechanization, hence all the work, including grape-picking, is done by hand. We tasted two of his 2002 sauvignons blancs—both are exported abroad but are hard to ﬁnd. The small production Sancerre Monts Damnés is made from 45-year-old vines. It is perfectly balanced between fruit and acidity, showing hints of meyer lemon, grapefruit, and acacia ﬂowers, all encased in a good dose of mineral. 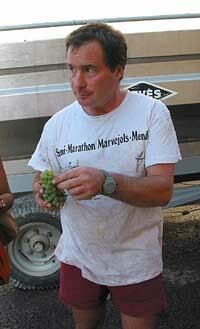 His Sancerre Monts Damnés Cuvée Buster is an even smaller production wine at just 600 bottles. This wine is named after New York wine importers Louis/Dressner’s dear dog Buster. The adorable part-pit bull and part-Welsh cardigan corgi’s mug peeks at you from a label around the neck of the bottle and the contents of the wine are just as sweet as the pup. This wine is made from the best plot of the Monts Damnés vineyard, fermented for nine months in new-ish oak barrels (two to three years old) in order to produce a richer wine (though by no means an over-oaked wine) that will age nicely. On tasting it one instantly notices that it is a ﬂeshier wine with complex layers that evolve in the glass. Sancerre wines are usually made for early consumption but the great Sancerres from the likes of Labaille’s Cuvée Buster Sancerre and brothers François and Pascal Cotat (also in Chavignol) are deﬁnitely the kind of wines that one can sit on a for a decent amount of time. If you do not get the opportunity to visit any of these winemakers we suggest you step into the local restaurant, La Côte des Monts Damnés, for dinner. The restaurant serves incredible food and has a great wine list featuring old vintages. The food here is creatively classical with modern touches. Many of the dishes are peppered with the local goats’ cheeses, like the tagliatelle de crottin au beurre muscade, a sumptuous dish that was essentially a creamy pyramid of warm aged Crottin de Chavignol wrapped in tagliatelle pasta and sitting in the most delicious butter sauce that was somehow enlightened by the muscadet. Indulge all you can in the cheese while you are here by ordering Crottin de Chavignol for the pre-dessert fromage course. A local AOC speciality, this full-fat goats’ cheese is tangy when young and creamier when old. The slightly funky older ones are great with a few slices of fresh bread at the end of a meal, accompanied by a golden rich old-vintage Sancerre. Pameladevi Govinda is travel correspondent for Lucire. 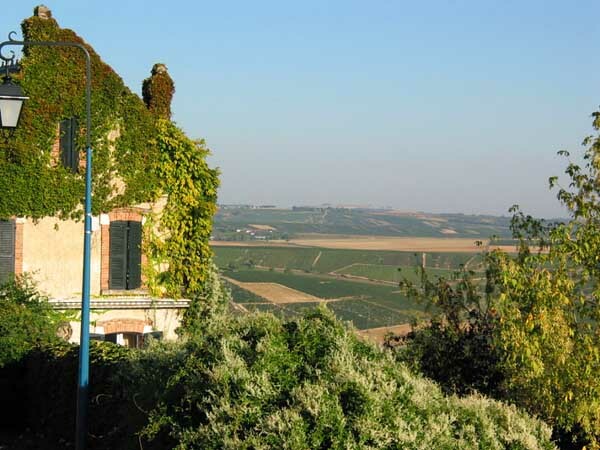 MAIN PHOTOGRAPH: Another view in Sancerre on a blissful day. ABOVE, FROM TOP: Jean-Paul Labaille shows us his Sauvignon Blanc grapes. Jean-Paul Labaille and the author.